When a little boys dirty socks kept disappearing and he kept getting in trouble, he decided it was time to figure out what was happening to his socks. 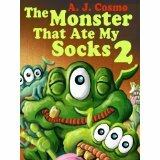 He stayed up one night and saw a green monster with three eyes and a mouth full of teeth eat his socks. The boy and his friend Ryan set a trap and capture the monster. They find out that the monster has a family to feed. Then they make a new discovery. There is something the monster loves more than dirty socks. Want to find out? Read this cute book to see what it is. why the sock monsters are eating the text books. They learn there is another monster there eating text books and anything wood. They have to try to save all of the monsters and keep the administration from putting in cameras. Read to find out what happens. Great story of friendships that last. 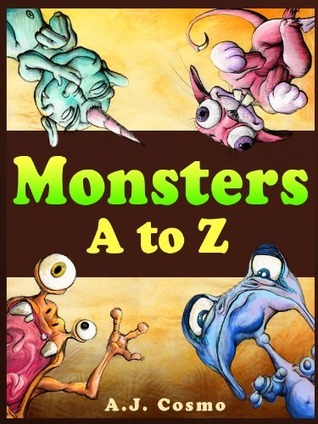 Out of all of the monster books this author has written, this has to be my favorite. 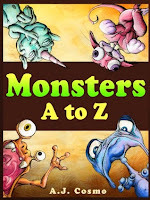 He has a monster for each letter of the alphabet. He not only tells you their name but gives their characteristics. His drawing and names remind me of Dr. Seuss. Two of my favorites were the Pompificus who eats compliments and the Inkbat who is responsible for leaving stains behind that no one ever admits to. This is a fun book and one my grandson loves. Jaques Ba’bur was the greatest hair dresser around. 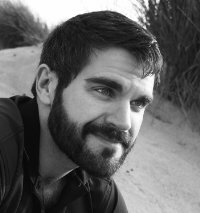 One day an inventor came to town and challenged Jacques to compete against his Hair-Bot 3000. Jacques was confident in his abilities. 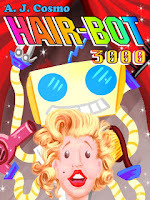 He styled one hair after another and was defeated by the Hair-Bot. Then he chose two twins. They were unhappy with their hair-do. The hair-bot tried again and again but his young girl got more and more hysterical. The Great Jacques looked at the broken Hair-bot crumpled on the floor and handed the two girls a lollipop. After all he knew what his customers wanted. 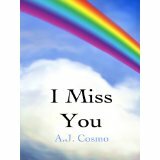 This is a simple poetic book that is reassuring in its message. It talks about missing someone. But, it reaffirms that they will be together again some day and that everything will be okay. I really liked this book. 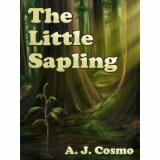 It is the story of a little sapling that is trying to grow. As it grows it asks a bush and a sapling and taller tree to let some sunlight in. They are mean and rude and refuse. One day the tree is taller than all of them and they ask him to let them have some sunlight. The Tree remembers how they treated them and must decided what to do. Will he do the right thing and share or will he repay evil with evil. Read the book and find out. Annette the albatross was lonely. Everyone around her was a sea gull. They refused to let her join in any of their fun because she was an albatross. She tried to disguise herself so they would let her in but it didn’t work. One day a strange looking bird flew in. 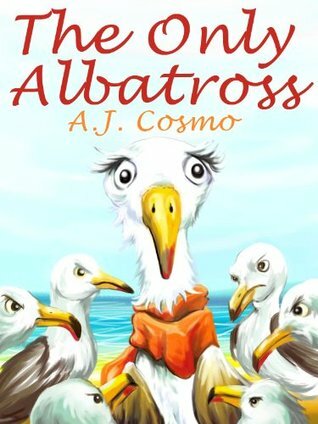 He told Annette he was an albatross. She recognized him as a seagull. He told her that he had come from a place where he was the only seagull among a bunch of albatrosses. Annette was excited. She introduced him to the other seagulls and got directions to the other albatrosses. Both of them were very happy and no longer lonely. 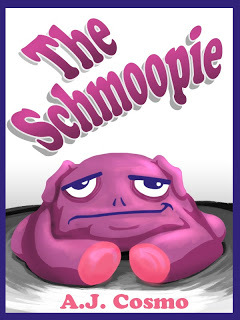 The schoopie was a very sad creature. All he did was lay around and mope all day. Two different children took him home to try to cheer him up. When nothing worked he was kicked out of their homes. A strange family took him home with them. They sounded even more sad than the schmoopie. Suddenly the schmoopie decided that he could find his own way in the world that it wasn’t as bad as he thought it had been.